My running buddy today has considerably shorter legs than me……despite this she’s speeding ahead, ears flapping in the wind. Normally having a running buddy this much quicker than me would demoralize me (and the ears thing would totally freak me out) but today, my running buddy is Missy, the Springer spaniel, and, not only is the fact that she’s having a blast as we go faster and faster making me run quicker than normal, the fact that I’m attached to her by a bungee cord means she’s actually pulling me along a bit. This is Canicross. Canicross is running along attached to your dog. 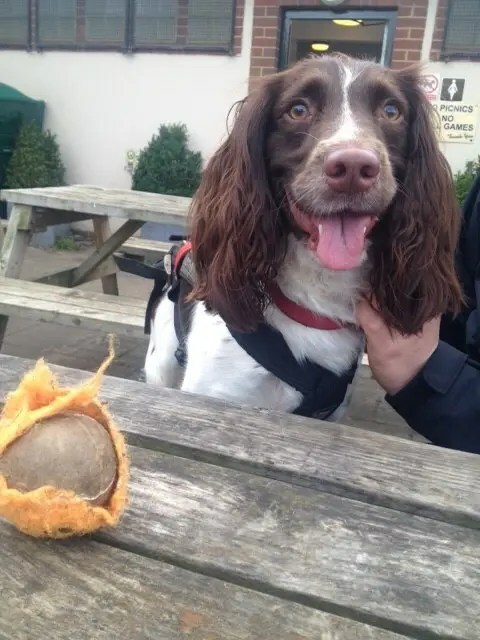 I’m here to try it in Wimbledon with the company Dogfit who are offering sessions and classes to introduce people to the sport, but also to help ensure that both, they and their dog get the most out of the experience. ‘Of course you can just run with a dog on the lead, but that doesn’t put your body at the best angle,’ says Dogfit founder Ginetta George. When you run with a dog on the lead, not only can they tug and pull at your arm, which can lead to injury, they’re also not really helping you run faster. In Canicross you’re attached to the dog via a special harnesses you both wear – they’re comfy, you’re comfy and you get the added bonus of some Fido power. The harness consists of two canvas leg loops which you step into and some loops that wrap round your hips and waist. On the front of this is a large D ring which you clip to a bungee cord that’s attached to the dogs harness. The bungee cord means that there’s a bit of give as the dog starts to run so you don’t get jolted. This special configuration basically ensures that the pressure from the dog pulling is carried by your hips and your core, not your lower back. My back is extremely weak but it didn’t twinge once when I was running with Missy. This also allows you to take back some control from the dog – if you need to slow their pace a little bit you simply lean your hips back slightly and this naturally puts the brakes on. But if you’re like me, as soon as you see a long straight flat bit of course you don’t want to put the brakes on. Seeing Missy’s happy little face and flappy ears as we went faster and faster meant I wanted to speed up – and, even when we were slowing things down, having her pulling on me, ever so slightly meant I ran faster than I would normally – but it didn’t feel like I was pushing myself harder. 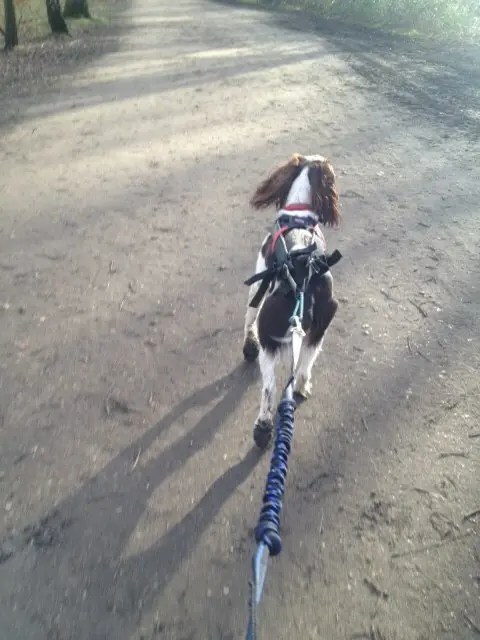 Going up hills was an absolutely breeze – I even sprinted up a couple..
As well as the fun and the added fitness push though there’s a few other benefits to Canicross – you’ve got your own little furry bodyguard which makes running that little bit safer. You’ve also got a small fluffy nagger skipping round your ankles daily which helps boost consistency – they’ve got to go out, so, why not make a run of it? The extra exertion of running for a while rather than just plodding along on their lead is also good for your dogs health too. Oh, and if you don’t run, you can powerwalk. Because it’s better for the dogs paws and legs to run off road, Canicross takes place in parks and woodlands. This can mean mud. I’m not a fan of mud, Missy however had no such qualms and would happily yomp through inches of the stuff – and where she went,I, generally, followed – my trainers have spent today in the washing machine (low heat, quick wash) as there was no way I was getting the mud off them otherwise! Trainers also don’t offer brilliant grip in mud and as such, you’re going to need to add some trail shoes to your shopping list if you take this up properly. Any size dog can take part – yes, even ones with little legs – but it’s advised that dogs are at least 12 months before they start Canicross – this is so the harness doesn’t stress any bones in the legs and shoulders that aren’t quite properly formed yet. If you have a young dog check with your vet that all is okay before you start running. The kit isn’t super cheap. A starter kit with a harness for you and one for your dog costs £99 via Dogfit. You can buy cheaper harnesses online but these might not fit properly which can put strain on your or your dog,or if they aren’t finished correctly can rub or chafe your furry running buddy – which no-one wants. What happens if they see a squirrel? Ginetta tells me that actually once dogs get into run mode they’re pretty focused – especially if they are running with a few other dogs at what point they kind of go into a pack mentality. At this point squirrels could dance past them in feather boas and they wouldn’t notice. If someone does get a bit wayward though, you can always grab the bungee with your hand and take back control. So, do you want to try it? Dogfit are working with instructors around the UK to offer classes that help introduce you to the sport. The current list of classes can be found here. If you’re not near one of these, there are Canicross clubs around the country many of which do offer beginners sessions to help you both get used to how it all feels. Let me know if you give it a try. In fact, post photos. Oh and just because she’s super cute, here’s a head shot of Missy. That was fun…now, throw the ball.